Nora works in London but spends her weekends with her sister Rachel in rural Oxfordshire. They have a close but sometimes tempestuous relationship. Rachel is found brutally murdered, and her dog has been killed too. Rachel had been seriously attacked when she was a teenager so there is speculation that the same person came back to finish the job. Nora narrates the story, spelling out her grief and suspicion of the men that Rachel knew. But as time goes on, Nora's own weaknesses and aggression become clearer to the police and the reader, and she falls under suspicion. In the unabridged audiobook, Fiona Hardingham performs the role using a fragile nervous tone. 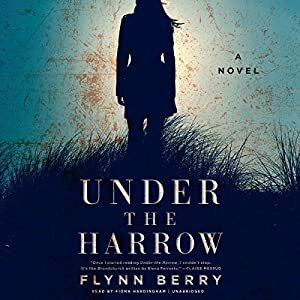 Under the Harrow is a short book at 6 hours for the audiobook reading, and 240 pages in paper. It's an efficient novel, with short sentences and short chapters. The plot details hold together well and Nora is a compelling narrator, reflecting on her relationship with her sister and what their lives have amounted to.